Truly, this is a city that loves to watch winged animals duel to their bloody deaths. Puerto Rico keeps America well-stocked with vicious, oversized roosters. Breeders in the island territory, where cockfighting is legal and celebrated, cram the angry birds into crates and ship them to cities all over the U.S. The final destination of many of the roostergrams is unknown – cockfighters hide in a shadowy network – but smart money is on a ton of them going to Philadelphia. The city has a serious cockfighting problem. 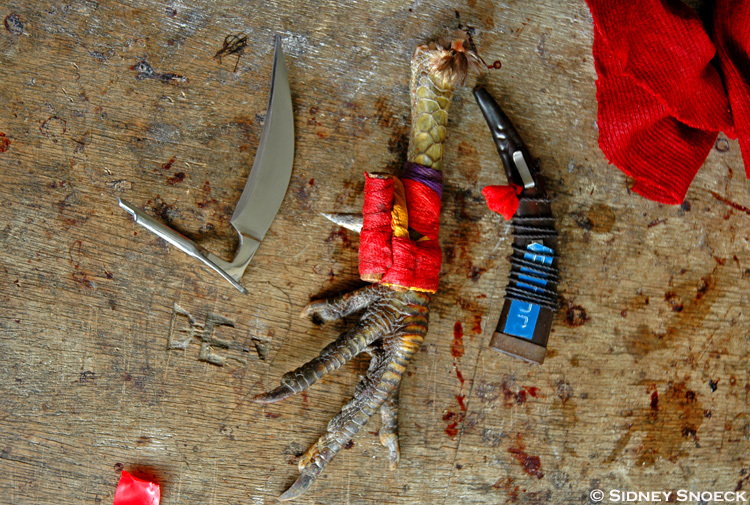 Just last week, police officers doing a drug sweep in North Philly uncovered a makeshift ring, 47 roosters and paraphernalia – stuff like gaffs, the razor-sharp foot accessories that the birds use to tear gouts of blood from each other. (Here's a very horrible picture of a gaff.) But law enforcement and animal-cruelty officials have battled these operations for years, freeing dozens of birds in 2011, busting a bulletproof glass-fronted arena in 2010, smashing a basement fighting ring/poultry hospital in 2009, arresting 84 suspected fighters and fans (“cockers”) in 2002, et cetera. Cockfighting existed in Philadelphia in the 1970s, according to this story in the Reading Eagle detailing a bust: “While police found no fight in progress, they discovered bloodied birds hidden in a second-floor closet.” They were happening in the 1860s when the Pennsylvania Society for the Prevention of Cruelty to Animals was established. There's even evidence that George Washington, who lived in a presidential mansion on Market Street in the 1790s, loved to see two enraged biddies go toe to toe. George Bengal, the head of Humane Law Enforcement for the Pennsylvania SPCA, has seen Philly's lust for rooster blood firsthand. His agency typically gets seven or eight calls a month regarding possible fights in Philadelphia* – a number that hasn't shifted up or down over the years. The most bizarre case in his career, Bengal recalls, actually happened just outside Philadelphia, in Bucks County. He had been called to investigate suspicious activity inside a Holiday Inn at around 1 p.m. on a Thursday. Bengal arrived to find the parking lot thronged with cars from “just about every state” in the nation. Pushing his way into a room, he was stunned to find the place cleared out to make way for a battle royal. There were 56 men crammed into the space, eyes on a ring that had been set up where the beds used to be. Guns, drugs and dozens of live roosters added to the strange décor. Bengal and his officers helped arrest everyone there that day – and carted away 70 deceased birds, which had been stacked in the bathtub like a low-rent butcher's case. In the past, fans of the sport kept current with publications like The Gamecock and The Feathered Warrior. These magazines ran news of wins and losses and were supported by advertisements, just like GQ. But after detectives became subscribers, the magazines shut down and cockers took to the Internet. (The popos should probably check out this site.) Nowadays, Bengal and his cockfighting-fighting cohorts dig out their prey using undercover officers or tips from citizens, who can report roosters crowing in their neighborhood to a 1-800 hotline. How do officers identify a fighting arena? Tools of the trade left lying about, like gaffs and other puncturing weapons, or medical supplies for sewing up the slashed flesh of fowl or human, certainly help. Sometimes there are even trophies, like in boxing. But mostly they rely on the birds themselves. Anybody dealing in fighting roosters in Philadelphia will have a hard time passing them off as run-of-the-mill poultry. And then there are the anatomic alterations. Fighters shave the chests of the birds so they don't get hyperthermia in the heat of combat. They also cut off the combs and wattles, a practice known as “dubbing.” This is done to reduce the animal's weight, and because if these areas bleed profusely, it would lead to an abrupt end to the fight. To cockers, quick deaths are boring. With ticket prices running as high as $50, Philly's cockers are no doubt royally pissed when the authorities swoop in to halt the battle and confiscate everything. Both cockfighting and watching are felonies in the state, punishable by up to 6 years in prison for each count. But what happens to the roosters when the bad guys are taken away? On the happier side, hens and chicks get to go to a farm for rehabilitation. * Not throughout the state, as originally reported.